Peter's latest kids record is now on CD! My Trampoline winner of a NAPPA GOLD Award! With songs about a trampoline, an African leopard tortoise named King Ferdinand, a picky eater named Peter, and the scarcity of kids named Steve, Himmelman mixes his offbeat sense of humor with lush pop stylings and irresistible beats to delight everyone in the minivan. Himmelman, a Los Angeles-based father of four, writes kid-friendly lyrics that can be hilarious and reflective at the same time. Any kid who has ever pondered the immensity of the universe will love the meditation of "Ten Billion Blades of Grass." "The idea for the song struck me when staring at our lawn one morning. Each of the blades of grass seemed like a sentient being, with perceptions, however subtle, about the world around them. The thought occurred to me that they get along so well because they're one big family." "Statistical Factoids" will delight young brainiacs, "Main Dish" gives the nod to both Julia Child and Charlie Pride and "Workin’, Playin’ and Dreamin’" offers up a bluesy romp with stories about kids who are making their dreams come true, with a little help from mom and dad. The high-energy collection of tunes concludes with a sweet "Lullabye (with Baseball and Trains)." 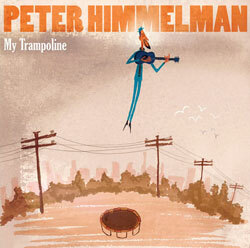 According to Himmelman, the songs on My Trampoline were inspired by real life. "We've had a trampoline in our backyard for the last ten years and our kids have had at least as much fun with it as any $30,000 swimming pool," he explains. "I figure anything that simple and that much fun must have a lot of special significance. There’s something very metaphoric in a trampoline as well; you’re always striving to gain altitude ... and even though you may never quite get aloft, there's magic in the trying."